He was reddish-brown, furry and cute, and we’d come to watch him die. More accurately, perhaps, we’d come to test a notion: If you’re going to eat meat, you had best come to grips with the fact that the supermarket may be where you buy your food, but that market is not where it comes from. Between that theory and reality stood a pig. It’s something of an irony: At the same time that we’ve come to glorify chefs and fetishize farmers markets and farms—”You have the J.R. Organics CSA? I’m with Suzie’s Farm!”—a large percentage of the population seems convinced that meat is born in plastic. The idea that a head of lettuce grew out of the dirt might not upset the equilibrium, but how many are comfortable with the idea that the pork in that vacuum pack was warm, fuzzy and very much alive right up until the moment it was unceremoniously slaughtered? And that’s why we found ourselves driving our Prius a mile up a dirt road in the far reaches of East County. As we emerged from a stand of oaks and rounded a bend in the road, we saw the gate to Womach Ranch and entered, pulling up to an electrified fence. The scene on the other side was nothing if not bucolic. Chickens and ducks roamed freely, frolicking around a pond. As I shot pictures of the chickens wandering amongst the horses and dogs, I had a strange feeling that something large was just behind me, a feeling confirmed by a long lick of the back of my arm. I turned and found myself face to face with the big eyes of a large, double-wide brown cow. I smiled, laughed and received another big lick. The only thing missing was the guest of honor. I had never bought a live pig before, but I suppose I’d have expected him to be wandering with the other livestock. Curtis Womach, the proprietor, told us that he was up on the porch on the side of the house. When we got there, the pig was indeed there, in a cage. I couldn’t help but note the contrast with the pastoral scene below. The fact that our 80-pound Red Wattle hog was confined in this cage when the cows, horses, chickens and ducks were wandering freely only yards away spoke volumes about what was to come. I bent down to look at him. He didn’t look up. Did he know what was coming? Did I? It was just then that Curtis handed me the rifle and a three-bullet magazine. I’d thought about the moment of the kill but never imagined that I’d be the one to pull the trigger. I don’t know that I’d have made the trek out this far had I known that. But, in the end, pulling the trigger wasn’t difficult. A single shot through the forehead and he was down. What came next—a knife stroke across the neck—was decidedly less easy. Could it ever be otherwise, watching a creature that had been alive a moment ago bleed out? And it got worse from there. The next step was to scald the pig. This released enzymes in his skin that made it possible to remove the fur. There are two ways to accomplish that task. One is to take an acetylene torch and burn the fur off. This, though, gives the skin an odor. The other approach—the one we chose—is to do it by hand. There was something about the process of removing the pig’s fur from his skin that was gruesome. This step, more than any other, spoke to the transformation of live creature into meat. It was happening before my eyes and at my hand, one knife scrape at a time. As I pulled the knife down, the reddish-brown fur came with it, leaving behind pinkish flesh that looked disturbingly familiar. And as I pulled that knife down, I was, once again, the agent of that transformation. 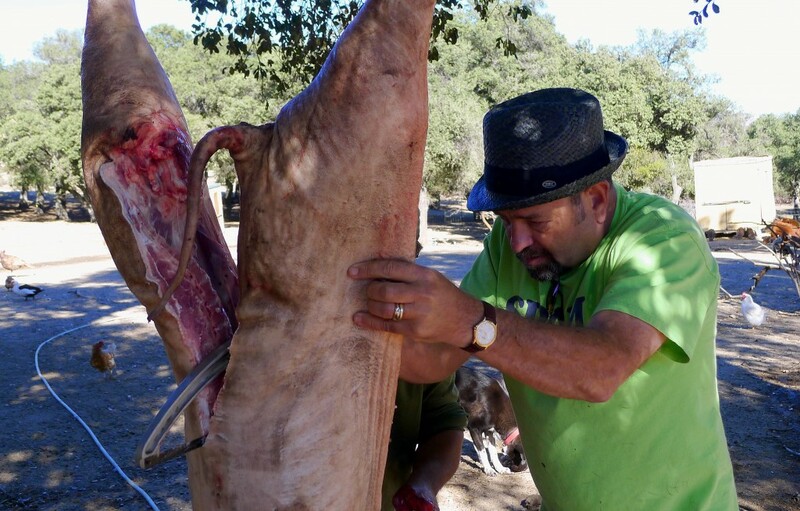 The next step ought to have been one of the most troubling: cutting the pig’s body in half from tail to snout with a hacksaw. It, too, sounds gruesome but, frankly, was not. At some level, it seems, that transformation had already occurred: This was just a slightly different version of cutting meat. It was no worse than cutting off a duck’s head or chicken’s feet. Indeed, that was, essentially, the same story for the remainder of the process. From half a beast, we reduced the pig to its primal cuts. From there, we butchered it into the sorts of smaller cuts you might see in a supermarket: baby back ribs, spareribs, shoulder, loin, tenderloin, shank, ham, etc. There were also some parts you might not see often at the market: pork liver, trotters, kidney, neck, brains, heart, tongue, cheeks (the whole head, really) and the like. And we’ve either used or have plans to use every part. The author splits the pig. I came to realize that I had not fully understood why we’d gone to this ranch in distant East County until we’d gotten there and been through the process. Yes, in a sense, we’d gone to test a notion. But more than that, I’d gone to test myself. It was one thing for me to say I understood that the meat I bought at the supermarket was not born in that plastic. It was something else altogether to see for myself that the pink piece of plastic-wrapped pork was once furry and cute—and for me to be the instrument of that transformation. How, I suppose I wanted to know, would I react? Would it be like water off of one of those ducks’ back? Would I sign up for the vegan corps? In the end, the answer was neither. It was a more difficult process than I had expected. It truly drove home for me the importance of using every part of the animal. We gave that pig no choice. In that cage, he was already meat. He just didn’t know it quite yet. He was born to be meat. Having looked a beast in the eye while he was on the hoof, and having had a hand in every step along the route of his transformation into meat, I still plan to eat animals. But I’ll do so from the standpoint of recognition and respect for the realities of the process.